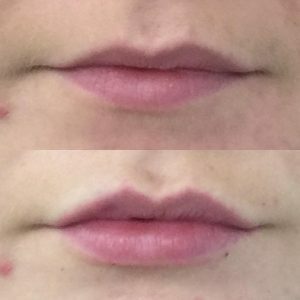 Lip fillers for young women, for less young women and men. Our Doctors understand that everyone has different lip enhancement desires. You choose what you want. 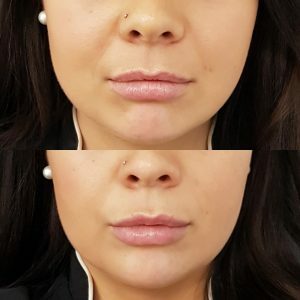 Young women may want a full lip plumper with a perfect pout. 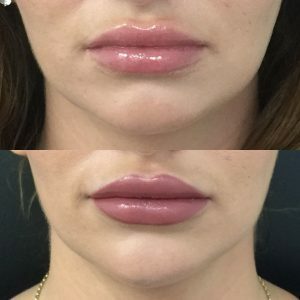 For less young women the biggest fear is that our Doctors will overfill with lip injections. What look do you want? Our Doctors offer a free assessment at the outset, they look at your natural assets, ask what you want to achieve, before you decide. Our Doctors have tended to our client’s lip enhancement needs (young and less young) for over ten years. We assess and discuss fully what you want before we start. This obligation FREE assessment is so you can feel confident before you make any decisions on the important step of investing in yourself. 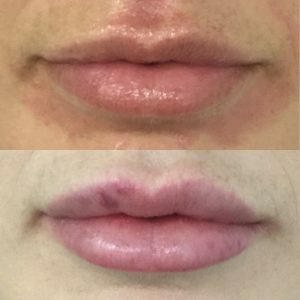 Lips fillers are used to create plumper lips. Lips are a central feature of your face, so the size and symmetry of lips are essential. 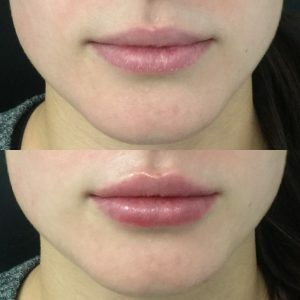 Some young women prefer a subtle enhancement to correct asymmetry or subtly enhance, while others want a beautiful pout. So each cosmetic lip enhancement is different, as you will see from the collection of our work below. Adding fillers restores volume that has been lost naturally over time. 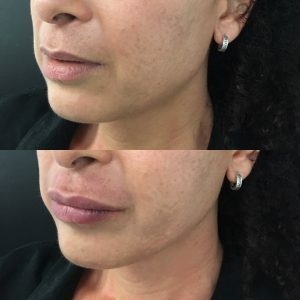 Over time our lips get thinner (creating a more masculine appearance) and sometimes upper lip wrinkles and lines develop. 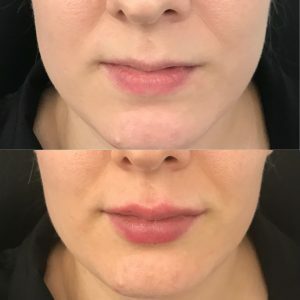 Some women choose to return a more youthful volume, not creating a big pout, simply restoring your lips to a size you had when you were young. 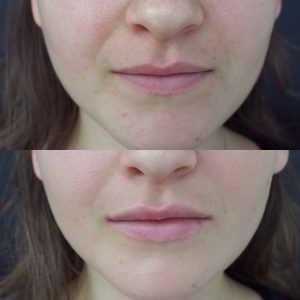 Lip fillers form a defined border, cupids bow, smooth upper lip lines and increase the volume for lip rejuvenation. 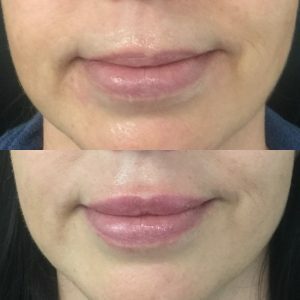 Lip Injections for Wrinkle Treatment. Lip injections can be used to give your lips a smoother outline, reduce lipstick bleeds and smoker’s lines. 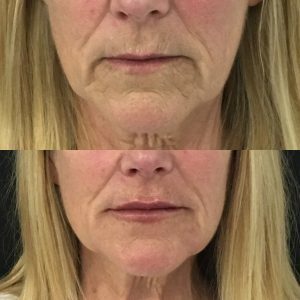 Over time with movement around the lips some women develop upper lip wrinkles. Top lip lines can be made worse by smoking but ‘smoker’s lines’ are not always caused by smoking. 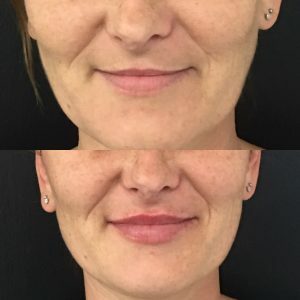 Treatment of lip wrinkles involves placing filler under the lips lines and into the border to give support. 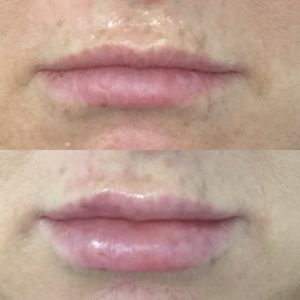 This treatment is not about increasing lip volume. 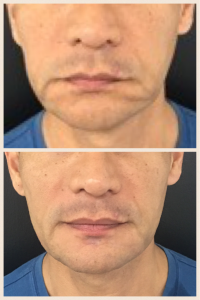 Some men also choose to get lip fillers to make their lips bigger for more fullness for young men. Men lose volume from their lips over time, although they do not develop upper lip wrinkles because of facial hair and naturally higher collagen content of their skin. 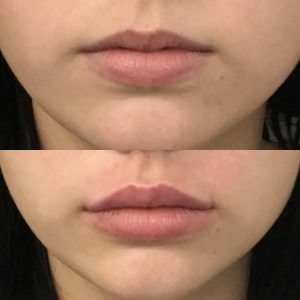 Which Lip Fillers Are Best? The choice of filler for lip injections and the amount of filler required depends on what you want to achieve. 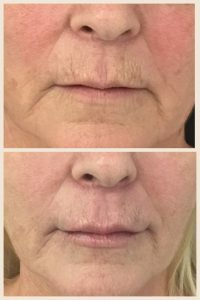 For lip wrinkle treatment 1ml of a thin filler is used. 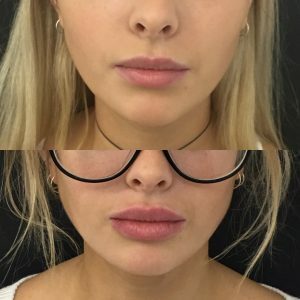 If you require a bigger volume 1ml of thicker lip filler or 2ml of a thin lip injection. 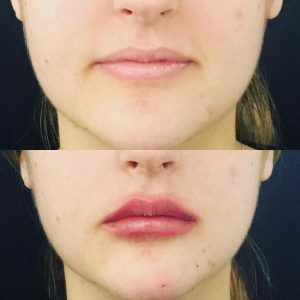 What Is Involved In Cosmetic Lip Enhancement? In younger women, fillers are commonly placed more into the body of the lip to increase natural volume. 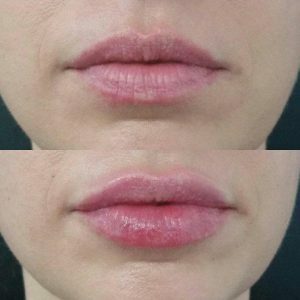 If treating lip wrinkles, the lip injections will be focused on the border and surrounding lips, not necessarily increasing the volume. 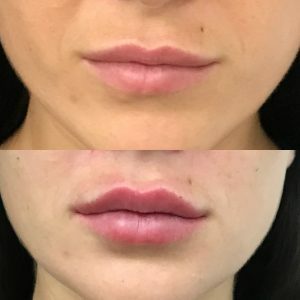 How Long Does Cosmetic Lip Enhancement Last? Generally, lip fillers will last 6-12 months. Longevity depends on the individual and the product used. 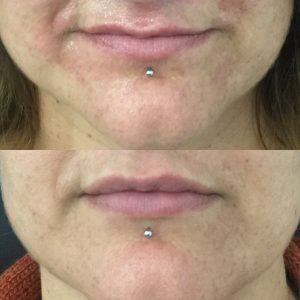 With lip wrinkle treatments it is usually best to get a top-up treatment around six months. After the second treatment, you may find the lip treatment lasts longer. The revolutionary Aptos thread lift has specialised threads which can be used for volumising of the lips and other facial areas. Aptos threads are particularly useful for people in dermal filler does not last. 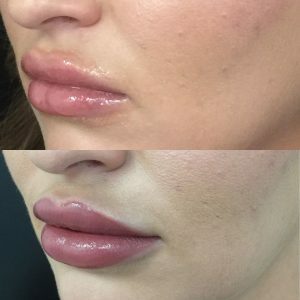 If you have problems with you lip fillers wearing down quickly, this may be an alternative approach to treatment. 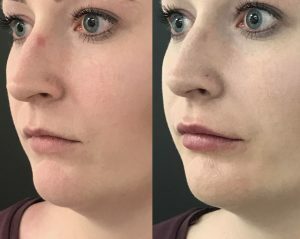 We continually update our lip filler before and after photos. Remember when looking at these the outcome depends on what your natural lip asset is before treatment. The different after results are achieved using a variety of fillers. Our Doctors will talk through all of this with you before you decide which treatment to proceed. 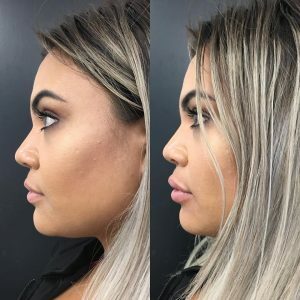 Enjoy the gallery of some fabulous before after lip injections. 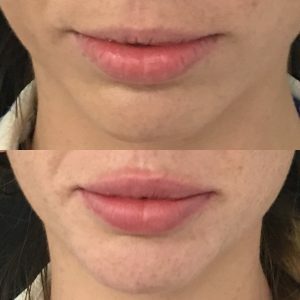 What Is Involved in Lip Enhancement? Most lip fillers contain local anaesthetic so you do not require block. A numbing cream is applied 20 minutes before lip injections. You will feel some needle pricking at the starting injection but quickly the lips should feel numb. There will be minor swelling of the area after treatment. The swelling takes 1 -2 days to settle. Is There Downtime With Treatment? There is risk of bruising. It is best not to get this treatment prior to an important event. It is best not to drink alcohol or do strenuous exercise after treatment. There is generally some swelling which can last 1 to 2 days. There is risk it can precipitate cold sores, so our Doctors will prescribe prophylaxis if this is the case.